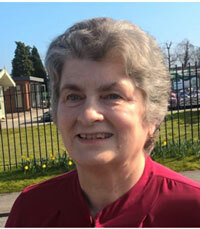 Sylvia Baker is a biologist and part of the leadership of the ‘Christian Schools Trust’. She co-pioneered one of the oldest of the new independent Christian schools in the UK, working as a science teacher for twenty-seven years. Having obtained two biology degrees in the late 1960s, Sylvia completed her PhD in Education in 2010 (University of Warwick, UK). Then, as part of a research team, in association with Professor Leslie Francis of Warwick University, she investigated the outcomes of a Christ-centred education which takes creationism seriously. This led to her academic book, Swimming Against the Tide: The New Independent Christian Schools and their Teenage Pupils (2013). She continues to research the interplay between faith and education, with particular interest in science education. From 2011 to 2017, she was a Visiting Research Fellow at Glyndwr University. Sylvia has spoken on creation topics over many years and she authored the well-known booklet Bone of Contention. ap Siôn, T., Francis, L.J. & Baker, S. (2007) Experiencing education in the new Christian schools in the United Kingdom: listening to the male graduates, Journal of Beliefs and Values, 28, 1-15.
ap Siôn, T., Francis, L.J. & Baker, S. (2009) The theological case for Christian schools in England and Wales: a qualitative perspective listening to female alumnae. In: L. J. Francis, M. Robbins & J.Astley (eds) Empirical Theology in Texts and Tables (Leiden, Brill) pp 217-245. Baker, S. (2009) The Christian Schools Campaign: what were its long-term consequences? Research in Education, 81, 12-19. Baker, S. (2010) Creationism in the Classroom: a controversy with serious consequences. Research in Education, 83, 78-88. Baker, S. (2012) The Theos/Comres Survey into public perception of Darwinism in the UK: a recipe for confusion. Public Understanding of Science, 21, 286-293. Francis, L. J., Penny, G. and Baker S. (2012) Defining and assessing spiritual health: a comparative study among 13- to 15- year-old pupils attending secular schools, Anglican schools and private Christian schools in England and Wales. Peabody Journal of Education, 87, 351-367. Baker, S. (2013) Swimming Against the Tide: the new independent Christian schools and their teenage pupils. Oxford, Peter Lang. Village, A. and Baker S. (2013) Reasons given by UK churchgoers for their stance on evolution. Journal of Beliefs and Values, 32: 165-177. Village, A. and Baker S. (2013) Darwinian evolution among churchgoers in England: the effects of psychological type. Journal for the Scientific Study of Religion, 52: 557-572. Baker, S. (2014) Faith-based schools and the creationism controversy: the importance of the meta-narrative. In J.D.Chapman, S. McNamara, M. J. Reiss and Y. Waghid (eds) International Handbook of Learning, Teaching and Leading in Faith-based School (London, Springer) pp177-192.